So Ardbeg Day 2014 Australia is approaching soon, May 31st, and if interest in the social sphere is anything to go by this year tickets are going to be snapped up way quicker than a pro in a navy barracks. 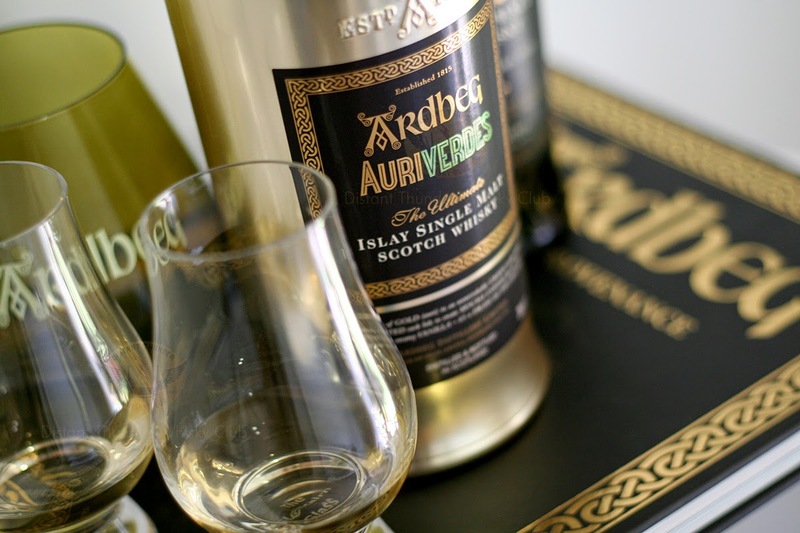 Let's not beat around the bush so before we begin, if you need to find out more about how to register and be part of Ardbeg Day, check out our recent post: Ardbeg Day 2014 Is Kicking Off - Ardbeg Day Sydney 2014. Coinciding with Ardbeg Day is of course the limited release Ardbeg expression bottled especially for the day. This year this release it is called Ardbeg Auriverdes, named after its golden whisky (Auri), and unmistakable green bottle (Verde). In this case you will notice the bottle is pimped out in all gold. I believe this bottle type I received is a pre-release ultra limited sample only, so don't expect to be thinking your going to be Puff Daddy & Biggie Smalls sipping from the bottle in the back of onyx limousine. In saying that I am thinking of hanging this bottle on a chain around my waist though for some extra pimp styling at Ardbeg Day. Previous releases of Ardbeg Day bottling have been pretty interesting and a little experimental in all cases. Ardbeg Auriverdes does not fall too far from the tree. Bottled at 49.9% ABV and without an age statement, it is certainly batting above its weight but then when does any Ardbeg not do so? On opening the nose clearly emits that smokey peaty Ardbeg statement we all love. What makes this release special is the American oak casks used to age this expression have had the lids specially made to impart that extra special influence. We are talking a toasting of the lids to a particular char finish that influences an apparent mocha coffee flavour profile. I have always found a nice espresso goes down well after a few drams of Ardbeg so on hearing about this alleged influence I got that telltale salivating dribble we all get now and again creeping from my lips. Nose: Milder dry peat smoke wiffs (benching marking against an Ardbeg 10yo), sweet vanilla oaks, some medicinal salts and some citric burn. After the initial taste has had time to rest I then found the whisky does developed a hazelnut coffee nose but only after the first taste. Official tasting notes say mocha coffee but there is a clear nuttiness to be found and certainly the coffee nose is no stretch of the imagination. You have to give the nose a chance here to really develop but when it does it is moorish to say the least. Taste: Initially sweet buttery oils that once warmed in the mouth then develop a clear caramelised raisin sugar hit in the sweet spots, with malt cereals and cinnamon spices in the background. Dram I say liquid hot crossed buns? Toasted smoke is prevalent in the right places but not all over as with the salts. Naturally being Ardbeg it is smokey and a bit earthy but not so much. Texture is a little soapy, like the PH is a too high and adding a couple of drops of water equalise it very well (But not too much! I am talking 2 drops max). Adding the drops will also release a wet charcoal effect previously hidden. Finish: Welling up slowly in the chest it becomes long and warming with the cinnamon spice, dry smoke, and caramelised sugars remaining on the palate rounding out a good dram. Is this the kind of whisky you will have a look back on in a few years and thing "I wish I could get some more of that"? My thoughts are presently a big no way. As much as this is a special release it is not mind blowing. It is an accessible whisky for the Ardbeg fans neither offensive nor overly challenging and sure to please which I am sure is exactly what is is supposed to do. I have had several tastings now with it side by side to the Ardbeg 10yo and I think the 10yo still trumps this expression on taste and at almost half the cost too. Ardbeg 10yo has those extra peaty medicinal nips and sweet tips with smoke wafts to explode on every sip. If you're Ardbeg fan then you will be happy to dram this over and over again regardless. Someone not so seasoned to Ardbeg will most probably be challenged to find a clear difference between either. If I was to give a dram then it would be a solid 6 out of 7 sitting just behind the Ardbeg 10yo at the finish line. Ardbeg do a great job of experimentation but always staying within their flavour profile making this whisky something all Ardbeg fans need to try at least once. Now if you want to be part of Ardbeg Day and any other Ardbeg event that may be in the future be sure to sign up at Ardbeg as a committee member to get the email updates for registrations. If you want to find out more about last years Ardbeg Day and the shenanigans some of us D.T.W.C. members got up to check it out here: What a Day - Ardbog Day Sydney 2013. We will endeavour to keep you posted on Ardbeg Day through our blog or our facebook page but best bet is sign up as a committee member yourself. D.T.W.C. was supplied a sample for review. All views and opinions are our own unless otherwise stated.